Estimate your maximum heart rate and your target heart rate based on physical activity intensity. 1) Gently place the tips of the index and middle finger on the palm (thumb side) of your wrist below the base of the thumb. Do not use the thumb from the other hand to measure the pulse. 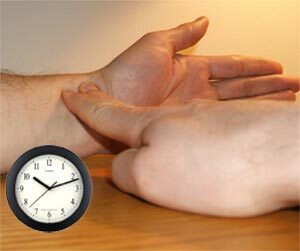 2) Press lightly with your fingers until you feel the pulse (note: you may need to adjust the location of your fingers until you feel the pulse). 3) Use the second hand on a watch or clock and count the number of pulses in 60 seconds or count for 30 seconds and multiply by 2. The result is your heart rate in beats per minute (bpm). Note: The usual resting pulse for an adult is 60 to 100 beats per minute.